Home Ecommerce Platform Top Online Retailers Not Showing Up in Google! What?!! It’s true. 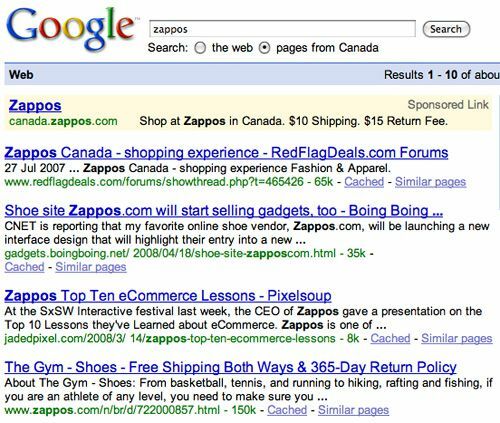 Many of the biggest and most popular online retailers with fat SEO budgets are not showing up for their own names or valuable keywords in Google search results. Most don’t even know it. How can this be? All the major search engines offer a .com search engine and a number of country-specific engines, like Google.ca, .co.uk, .com.au, .fr, .de and so on. These are local search engines, and often use geo-IP targeting to show the local search engine as the default when a searcher lives outside the United States. As you can see, a searcher has the option to restrict search results to only pages from his or her country. 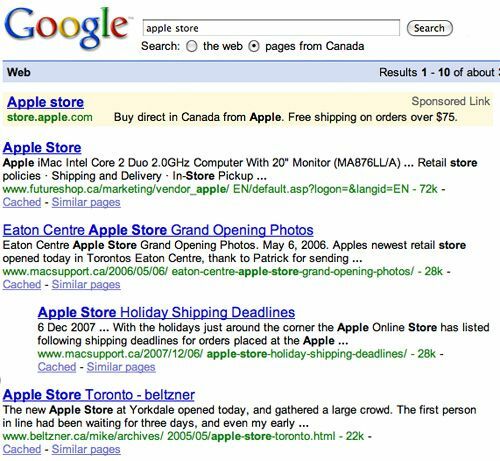 This is particularly helpful for searchers who are performing transactional searches – they’re looking for products to buy. Using the general “search the web” will often deliver US sites which requires the shopper to dig through the sites looking for shipping information and costs. Searching only pages from their native land, searchers can save time and discover online stores they purchase from over and over again. 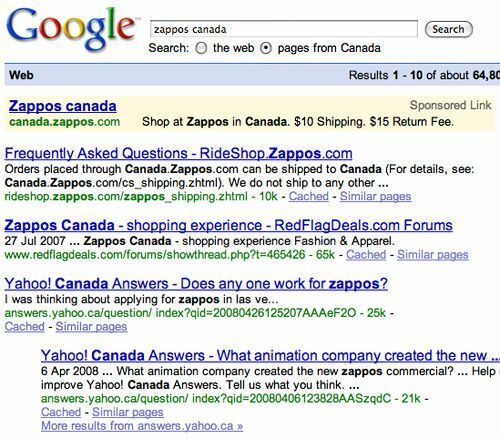 Canada.zappos.com should appear #1 for both terms, as it’s considered a “vital” result for its brand name. It does show up #1 or #2 in regular “search the web” results (users do not restrict to only their own country). But the issue is it’s not included in the “pages from Canada” database, so it will not appear for unbranded product searches, either. And according to Netconcepts research, unbranded search happens 40 times more often than searches for a specific store or brand. While we’re at it, let’s pick on Apple too. If you are using TLDs or subdomains, you will have to add and verify each separately. If you are using subdirectories, you can add them one by one and they will be auto-verified so long as your .com domain is verified. 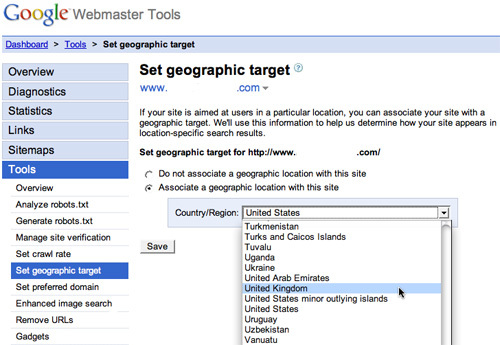 Please note that if you have a country-specific TLD like site.co.uk, you can only target to that country. If you want to target more you will need to set up subdomains or new TLDs for your brand. Keep in mind your click through will be lower if you use canada.site.co.uk – because the .co.uk tells searchers you are located abroad. This is probably the only time you’ll hear me tell you “don’t be a Zappos.” Enjoy it while it lasts.